Slept in a little later than usual. It surely couldn't have had anything to do with our eating and drinking the day before. Went downstairs to a wonderful breakfast at the hotel. The usual setup of mixed meats and cheeses, assorted freshly baked breads and rolls, cereals, fresh fruit, juice, yogurt, and espressos or cappuccinos. Today was going to be a day of exploring. 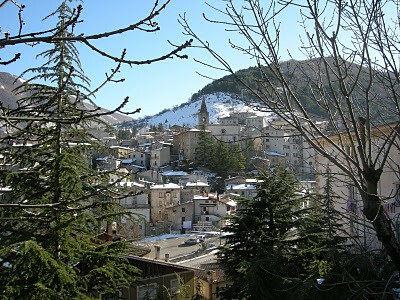 Frank's family came from a little town in Abruzzo called Rosciolo dei Marsi. That was going to be our first destination for the day. Of course we first had to get there. 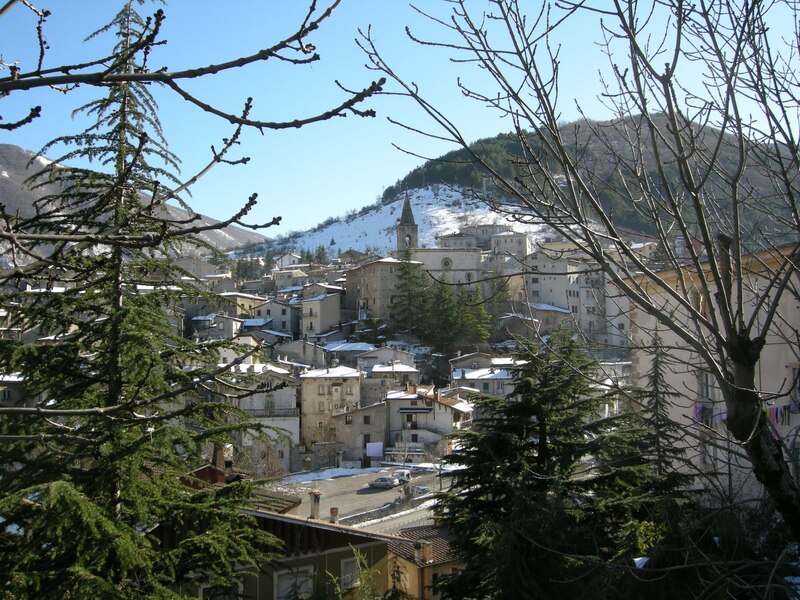 Once again we drove round and round Sulmona until we found the right direction for the highway. We wanted to take a scenic route instead of getting directly on the Autostrada so our roundabout way was perfect. The countryside around Sulmona is breathtaking. 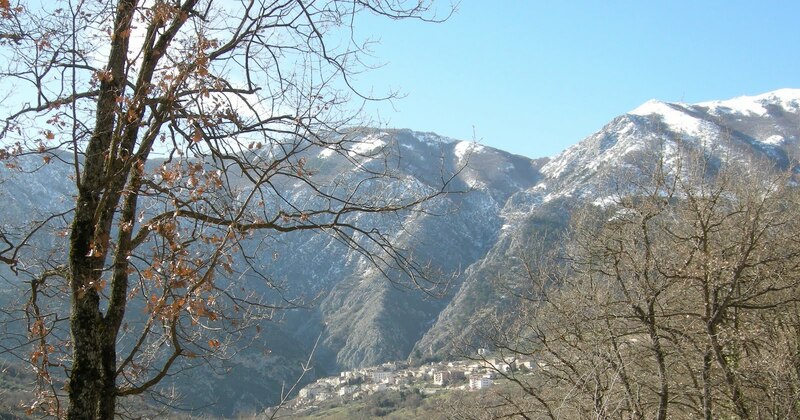 We wound our way through farmland and hill towns backed by the most dramatic mountains. The weather is still a little brisk this time of year and occassionally there was a little snow along the ro ad in places, but the sun was bright and warm and the sky was brilliant blue. 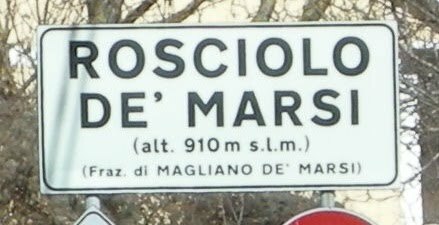 After a while we managed to make our way to the main highway and head for Rosciolo. We had to backtrack a little from yesterday's drive from Rome, but it gave us a different perspective on the route. As is typical of many towns in the region, you climb, climb, climb until you get to the town and then you continue climbing through the town since it's usually built into the side of a hill. We found the church and the small main piazza, but that was about all there was. All the little ladies looked just like Frank's mother. She must have been with us, though. We happened to have some things that Frank had written down about his heritage that were stuck between the pages of a guide book that got thrown in the suitcase at the last minute before we left home. Of course, since it's Stephen and Frank traveling, lunch was just around the corner. In this case though, it turned out to be many, many corners. We headed back to the highway to almost where we began this morning. There was a town we read about that looked intriguing and was just about the perfect spot to stop. One thing you always have to think about when traveling the small towns of Italy, as well as most of Europe, is you can't always eat when you want. Most small towns serve lunch from about 12:30 until 2:00. If you don't make it you might be stuck. 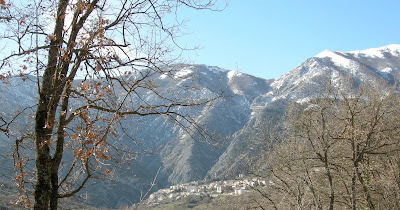 We were going to Scanno on the edge of Lago di Scanno. We had no idea how precipitous t he drive was going to be. Having driven in Rome and along the Amalfi coast, Stephen tends to not let anything bother him. This road was by far the narrowest and curviest (is that a word) we've driven on. Short two foot wall were all that separated you from a gorge hundreds of feet below. But what beauty. Pictures can't do it justice. Around every turn (and there were lots of turns) there was a new vista. We passed the village of Villalago and then came upon the lake and then the town of Scanno. There was still a lot of snow on the roofs. Another postcard view. Once again we drove up and through the town. 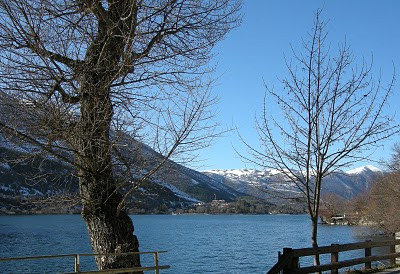 Since Scanno is on a lake it tends to be a summer resort. We did find a cute place for a pl ate of pasta, but this would not be the meal to write about today. Give us a few hours, though. After a little walk and a short drive around town and it was time to head back. The sun sets early in the mountains and we didn't want to get caught after dark on such a scary road. By the time we got back to the hotel it was almost time to get ready for dinner. We asked the hotel for another recommendation since they'd done such a good job the day before. They asked if we wanted to go up or down from yesterday. Since it was our only other night in town we decided to go up - all the way to the best restaurant in town. One of the nice things for us about traveling in Italy is most of the restaurants here don't make it into American guidebooks or English speaking web sites. The better Italian guides are only published in Italian. Not that we speak Italian, but we know to always ask the locals. You may have a hard time making it through the menu and you may end up with a surprise on your plate, but you'll not have a room full of people from your hometown in the room. Tonight's choice was Ristorante Clemente. The hotel had not been the best of giving directions, so we weren't sure if we were going in the right direction. We walked down a side street into an alley and then down a small almost hidden passageway before we found what had to be the most out-of-the-way restaurant in town. Yet when you get to the front door you see the restaurant is covered in accolades from every prestige Italian food journal. Owner Clemente Maiorano met us like old friends. We were seated and began to peruse the menu and immediately began to salivate. Too many choices for just one meal. We finally settle on our plan. First courses: L'elogio del porco (degustazione di salumi di piccoli artigiani serviti con bruschette e frittele) and Antipasto vegetariano. Since we know Stephen is not a huge fan of vegetables then we know who had the array and who had the vegetable antipasto. The pork was a huge selection of artisinal salamis and cured hams served with grilled bread drizzled with olive oil and little fried bread balls. The vegetarian version had an array or grilled marinated vegetables, fresh mozzarella rolled in breadcrumbs and sautees, and then an involtini or grilled eggplant rolled around ricotta and spinach, topped with crushed tomato and mozzarella, and slight warmed in a broiler. Only Stephen had a primi, this time Paparadella con ricotta cremosa, guanciale, pecorino & zafferano, a house made paparadelle, (a very wide but very thin noodle), with a ricotta cream, guanciale (the Italian jowl bacon) cooked crisp, pepper flakes and saffron. The pasta was rich with egg and the pepper flakes added just a hint of heat throughout the creaminess of the sauce. It was like little spice devils dancing on your tongue. This was followed by Salsicce alla Grillia con verza ripassata in padella for Frank and Braciola di maiale al mosta cotta con purea di patate all aglia rosso for Stephen. The salsicce was a house made sausage grilled and served with a pan roasted napa cabbage and the Braciola was sliced roast pork accompanied with an potato puree mixed with cheese and cream and red garlic until it was so rich and thick and clung to the fork. Since we couldn't pick one dessert we had to have a whole assortment. There was a pear and chocolate tart, lemon curd with forest berries, panne cotta with chocolate sauce, a rich brownie like cake, and finally a marzipan cake. Not to be left out was a digestif, this time a Vin Santo-like dessert wine called Zibibbo, from Sicily. While we sell Vin Santo at the shop, Zibibbo is a new find, soon to make it to our shelves. Basta as they say. We're done. A short walk back to the hotel and we're ready for a heavy sleep. Tomorrow we're off to Puglia. You can check out more photos of Scanno on our store's facebook page and food items from tonight's dinner on Stephen's page.